Opossums are, in my opinion, the easiest animals to trap, they are fairly slow and if you approach them quickly, they play dead. This is an amazing reaction to fear. Instinctively they understand that most predators will only eat live animals.When opossums feel threatened, they will fall over, their eyes will gloss over and they produce and odor from their mouths that smells like a decaying carcass. This is a very effective self preservation tactic that works well in the wild, however, Trapper Ron is never fooled. Sometimes the situation calls for a caring touch as in the case of one call I received. 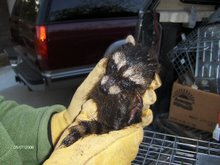 Not only for the animals but for the people that fear them.I was in between calls when I received a frantic call from a woman who said that there was an animal in her bath tub. She had no idea what it was other than it was white and looked like a large rat. I assumed it to be an opossum. She told me that price was not an option and that I needed to get there right now. I just happened to be in the area so I headed her way. Upon arrival I noticed a woman and a man standing on the front lawn. It seemed clearly obvious to me that they were very concerned. I grabbed my catch pole and proceeded into the house. The homeowners would not come in, so with some directions to the bathroom, I entered the home. To my surprise the opossum was still in the tub and when it saw me it did what most opossums do, it played dead.The funny thing about the situation was not that the animal was in a bath tub, but that it had a full roll of gray duck tape on its neck. At some point this animal had managed to stick its head through the tape roll and couldn’t get it off. I have no idea how long this poor animal had been dealing with this heavy roll of tape, however it explained to me why it could not get out of the tub. Using my catch pole, I managed to get the noose over its head and around the duck tape roll and gently secured the noose. As I headed out the front door of the home, with the animal in tow, I was amazed to see the homeowners literally running down the sidewalk away from me.With a chuckle, I proceeded to my truck and placed the animal into a transport cage. I removed the noose from the catch pole and carefully removed the tape. The homeowners were very pleased that the animal was out of the house, however, they insisted that I check the rest of the house before they would go back in. As always, anytime you require a professional trapper, make sure they are licensed with the Michigan Department of Natural Resource and insured. Cost vary greatly so do your homework and call several trappers and compare pricing for the services offered. The most rewarding thing about trapping is having the opportunity to help people. Sometime, I also get a great story in the process. In this case, I got to share a funny experience with my father.My family was finishing a birthday dinner for my mother, when my wife received a call from a frantic woman. Apparently she had discovered a raccoon in her mini van. Kathy, my wife, was concerned for the woman and decided to delay the birthday cake so that I could handle this emergency call. My father opted to come with me on this call. He loves the stories I tell and this time he would have his own to tell.As we drove to the call, I instructed my father on how to handle this type of call. I gave him basic pointers to assist me with removing the raccoon quickly. As we pulled into the driveway I had one last instruction for him. “Stop laughing, you have to be professional”. He was laughing because the husband was standing behind the mini van--tailgate open. He appeared to be on guard, protecting his family from being eaten by giant man-eating raccoons. He was armed with a hockey stick and he never took his eyes off of the mini van. The image was comical.I approached the rear of the mini van and I noticed that there was a Little Tykes wagon basically filling up the storage area behind the last bench seat. I looked in and around the rear and saw the tail of the deadly raccoon. As I directed my catch pole towards the raccoon, it moved to the other side of the wagon. I repeated this process and the stealthy raccoon moved again. After repeating this process several times and wondering how this animal could move from one side of the van to the other so fast, it occurred to me that there were two raccoons in the van.After a few more attempts, I finally had a raccoon noosed with my catch pole. I dragged it out of the van and towards my awaiting father. He opened a transport cage and moments later we had a raccoon securely caged. The husband and his wife carrying a small child approached very relieved that the animal was out of the van.There relief quickly turned to concern when my father told them there was another one in the van. The wife without hesitation, child in tow, quickly turned and ran back into the house. The husband looked at me almost embarrassed for how his wife acted.My attention turned back to the van and the remaining raccoon. With all of the commotion it had moved to the front of the van. I closed the rear hatch to prevent the animal from leaving prematurely and prepared to extract the animal from the driver side door.The husband, feeling more confident with this situation, pressed his face up against the front passenger window to get a better view of my actions. I slowly opened the door and sent my catch pole in. As the noose inched closer to the raccoon, it suddenly became spooked. In a futile attempt to escape, it ran up the passenger seat and leaped. It took every professional bone in my body not to laugh when I saw the simultaneous actions of the raccoon smashing into the passenger window and the husband falling backwards to the grass.Moments later, the second raccoon was securely caged.As it turns out, the homeowners had left their garage and van door open the night before. The raccoons had been in their car all night and day. They drove to church with their three kids earlier and the wife went to grocery store before calling me. They were amazed that the animals went un-noticed all day. That amazement turned to relief when my father told them that they were extremely lucky that one of the kids didn’t step on a raccoons tail.The call took all of 30 minutes, and we returned home just in time for birthday cake.